IS JOEL OSTEEN JUST AN ENTERTAINER LIKE OPRAH OR A DECEIVER? JOEL OSTEEN IS A FOOL AND DECEIVER WHO DOESN’T DO WHAT JESUS DID IN THE BOOK OF REVELATIONS TO CHRISTIANS. JESUS REBUKED CHRISTIANS PUBLICLY, OPENLY TOLD THEIR SINS AND TOLD THEM TO REPENT OR HE WOULD JUDGE THEM HARSHLY! The late John Osteen served the Lord Jesus Christ as pastor, evangelist, author, and teacher for sixty years. Ordained as a Southern Baptist, he received the baptism in the Holy Ghost in 1958, an experience which revolutionized his ministry into a worldwide outreach…John Osteen began Lakewood Church in a dusty, abandoned feed store on Mother’s Day 1959…John Osteen was driven by an amazing love for people of all ages, races, nationalities and walks of life. One thing is certain in a time of racial division John Osteen opened wide the doors of his church to all people, and all shades and classes of people came. John, even though he had rejected his Baptist theology (he did actually earn a Masters degree from Northern Baptist Seminary) he never lost sight of the need for foreign missions and his congregation supported and still supports a great deal of foreign mission work. At the time of his death Lakewood Church had risen to 8,000 members. I must be honest with you; out of all the WOF teachers my wife and I listened to we enjoyed John Osteen more than most. He did have a genuine pastor’s heart and a desire to see people come to a saving faith in Jesus Christ. We have many of John Osteen’s books and tapes in the DMI archives. It seems that his seminary education helped keep John from espousing some of the most heretical doctrines that are commonly taught by WOF teachers today. In the above sermon we can see the Health & Wealth “gospel” summed up three sentences. So despite the good things that John Osteen did as a Pastor he got ensnared by the subtlety of false teaching and ended up misleading millions before his death. Then Jesus said unto them, Take heed and beware of the leaven of the Pharisees and of the Sadducees… How is it that ye do not understand that I spake [it] not to you concerning bread, that ye should beware of the leaven of the Pharisees and of the Sadducees? Then understood they how that he bade [them] not beware of the leaven of bread, but of the doctrine of the Pharisees and of the Sadducees. Even though it seems to us that His disciples were a little slow on the “uptake” at times Jesus makes His point crystal clear to them — He was warning them to beware, to be on guard against the danger of their doctrinal errors, which Jesus likens to leaven in bread. Jesus knew that if left unchecked, like leaven in bread, their doctrinal error would spread. The leaven of false doctrines which he instilled in his son are now expanding and misleading more people than John Osteen could have ever imagined. Joel Osteen has absolutely no biblical training or experience to be a pastor. Charismatic pulpits are filled with people who feel “called” to the pastorate and that is enough for them and those who follow them. They attempt to build congregations on the “strength” of their calling. Some charismatic leaders may go on to some unaccredited “ Bible School ” for a year or two, none (which encompasses a large group of ministers) that we were ever acquainted with attended any legitimate seminary. Would you allow a surgeon to operate on you because he felt “called” to be a surgeon as a child, but never went on to medical school? Or would you allow someone to build your house who firmly believed God had called him to be an architect yet had never gone on to college to study architectural design? Of course not, it would be the height of foolishness! Yet millions of professing Christians are more than willing to follow a man (or woman) who says “God” has called them and has supernaturally equipped them to be ministers. (FWM doesn’t agree with this statement as we believe God can and has called many a man to the Ministry and has used them greatly who never attended any type of Bible College, but we do agree that those same men studied their Bibles daily and learned the Word.) These especially anointed men and women have no need to study Church history, hermeneutics, systematic theology and struggle through Greek and Hebrew as other ministers do. They hear directly from God (this is especially true for the sign-gift pastors, most seeker-sensitive churches are led by seminary educated individuals). So my first main concern is that we have a man in the pulpit of the largest congregation in America , being beamed around the world that has no biblical education or training for the vocation he says he has! To me we have a clear case of the blind leading the blind (read Luke 6:39) with the end result being masses of people falling into the ditch of spiritual ignorance, abuse and/or extremism. Osteen’s upbeat style is deliberate and authentic. ‘Make church relevant,’ he says. ‘Give them something to be able to take away. I find today people are not looking for theology. There’s a place for it, [But] in your everyday life you need to know how to live. That statement is loaded with seeker-sensitive “code.” My wife and I left a North American Baptist church of over 1,000 members which had as its acronym “GPARS” which stood for: (1) Grace; (2) People; (3) Authenticity; (4) Relevance and (5) Small groups. Of course Osteen’s “style” is upbeat, would you expect negativity from a positive confession devotee? No! Deliberate, absolutely, he really believes much of the WOF nonsense his father taught him all his life, not to mention whatever offbeat spirituality he may have gleaned from his two years at Oral Roberts University . Authentic? Without a doubt! What you see is what you get. Joel Osteen is a man without any biblical education but an admitted talent for marketing. To be a success in marketing you have to know where people itch and scratch it. Or, you have to create a desire in them by creating a hunger for something they currently do not have nor formerly knew they needed. All commercials can be condensed down to one of these two truths. This is exactly where multitudes of people are spiritually today. The above text also helps explain the phenomena of people like Robert Schuller, Rick Warren, Bill Hybels and now, Joel Osteen. Osteen goes on to say that “I find today that people are not looking for theology.” Well that is obvious because if they were they would not find any sound theology at Lakewood ! Although he does not reveal to the readers where he found this astonishing fact out, it appears the folks he has talked to have no interest in theology. Brothers and sisters, my wife and I can testify to you that the more accurately you understand God within the biblical context the better life you will live before Him. Tracy and I have a daughter, she does not like to eat certain vegetables but we MAKE her eat them from time to time. Why? As her parents, even though somewhat distasteful to her we know that eating them will be beneficial. I charge [thee] therefore before God, and the Lord Jesus Christ, who shall judge the quick and the dead at his appearing and his kingdom; Preach the word; be instant in season, out of season; reprove, rebuke, exhort with all longsuffering and doctrine. Son of man, prophesy against the shepherds of Israel , prophesy, and say unto them, Thus saith the Lord GOD unto the shepherds; Woe [be] to the shepherds of Israel that do feed themselves! should not the shepherds feed the flocks? Ye eat the fat, and ye clothe you with the wool, ye kill them that are fed: [but] ye feed not the flock. There are many biblical themes which are very “unpopular” and even politically “incorrect” yet the faithful pastor/teacher will expound on these topics as well so that the flock under his care is receiving a balanced spiritual diet and is able to walk in the full light of God’s Word and not in the shadows. What is Joel’s educational background and experience? Since we know his training is not theological, what is it? He did attend Oral Roberts University for two years, but his area of study had to do with television production and marketing. Meanwhile, son Joel, one of six children, was learning the business of television… ‘Growing up, I knew what I wanted to do. I wanted to be involved in TV production,’ he says. ‘That was just my passion.’ In 1981 he came home from Oral Roberts University (ORU) to start the Lakewood TV ministry. The younger Osteen’s television-marketing talents and his dad’s preaching skills resulted eventually in the church churches being aired on stations nationwide and in more than 100 countries. Joel Osteen had the ability to get his father’s heavily WOF influenced message out all over America and into 100 foreign markets. Due to this dynamic-duo of folksy preaching/teaching and highly visible presence on television Lakewood Church grew to close to 8,000 members at the time of John Osteen’s death in 1999. 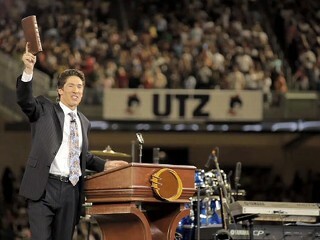 The appealing style of Osteen’s personality in the pulpit is unmistakable. It is part of the reason for the Lakewood ’s current level of success. It’s 10 a.m. when he began his sermon. The theme is practical as he gives example after example of the importance of following God’s timing rather than one’s own. He keeps the tone cheerful, optimistic. ‘God doesn’t want anybody walking out of here today heavy-hearted and downcast,” Osteen says. Joel Osteen is charismatic in his personality. He is not a bad looking man, his delivery is as non-threatening as the positive messages he delivers. Perhaps I am reading in to much yet when I read “practical” it makes me think that he believes teaching theology is somehow “impractical.” The example after example simple means he tells a lot of stories and anecdotes that somehow relate to the message in which he may cite one or two proof texts to make his point. It also concerns me when a pastor can make the statement that God does not want anybody walking out of here “heavy-hearted.” My Bible says “godly sorrow worketh repentance…” (see 2 Cor. 7:10). At times God does want us to walk out of a service “heavy-hearted” if we have been sinning against His will. We should allow the Word (when properly expounded) and the Spirit (when genuinely present) to break us, to convict us of sinful attitudes and practices. However if all you hear is “upbeat,” “cheerful,” and “optimistic” messages there is little opportunity for the Holy Spirit to work conviction in the hearts of the hearers. This folksy down home non-confrontational type of message also goes a long way in explaining the huge crowds that gather to be entertained. Entertained? Oh yes, it is not only Joel’s preaching style but the music of Lakewood is an important ingredient in drawing large hoards of people. Once Joel took command of Lakewood ’s already large congregation (between 6,000 to 8,000 members) he began to expand the musical talent as well. Four years ago, when Cindy Cruse-Ratcliff — former member of the Dove Award-winning Cruse Family gospel group — became Lakewood’s minister of music, the church had only one Sunday morning service…Soon after Cruse-Ratcliff arrived Lakewood expanded when two Sunday morning services were added…’The growth was extremely rapid,’ says Cruse-Ratcliff, who still serves on the 200-member Lakewood. Staff. Helping to spice up that mix are two of the most prominent names in worship music. Marcos Witt, who fills stadiums in Latin America for worship concerts was tapped in 2002 to pastor Lakewood ’s 3,000 member Hispanic congregation. Also adding diversity to the Lakewood staff is Israel Houghton, whose soulful worship anthems are sung around the world. The music at Lakewood is contemporary. They have musical stars that appeal to Hispanic (Witt), African-American (Houghton) and Caucasian members (Ratcliff). The musical team writes many of their own songs and nothing in the article is ever mentioned about hymns. This is not surprising when you consider that (to our knowledge) no seeker-sensitive or WOF congregation use hymnals at all, apart from the occasional singing of Amazing Grace. The charismatic movement’s brand of music has infiltrated almost all evangelical congregations that have forsaken the use of the historic hymns. At our former seeker-sensitive Baptist church we sang songs that originated from the Toronto “revival” and from the Vineyard movement, two examples of some of the wildest expressions within the renewal movement. Lakewood and all seeker congregations do not want to be associated with any denominational trappings or any forms of liturgical worship. Many of these churches have even removed crosses from behind their pulpits lest they appear to be too churchy to the seeker. In all our time spent among both Pentecostal believers and seeker-sensitive groups we never recited the Lord’s prayer as part of our worship. We never recited any of the historic creeds of the orthodox Church. I doubt there are three people who attend Lakewood who could recite the Apostles or Nicene Creeds, probably few know the Lord’s Prayer. Catechism classes? You’ve got to be kidding! In its place some groups may offer a new member’s class, but these classes are usually just general introductions to what the church has to offer the “seeker.” Osteen being a sign-gift believer offers classes which promote the concept of a second baptism in/with/by the Holy Spirit, but this aspect seems to be soft-peddled as well. What Is the Key to Osteen’s Success? Osteen I believe is probably the first of many WOF devotee’s who has melded the successful marketing techniques of the seeker-sensitive mega-churches with their positive confession health & wealth message. The blend becomes a potent hybrid that appeals to both sign-gift believers (sort of “charismatic lite”) and baby-boomer seekers. The message that God wants to bless His children with complete physical health, to give them great financial wealth and to demand little of them regarding their spiritual life is a highly appealing message. When you combine this with well known Gospel singers, highly orchestrated praise and worship teams in a decidedly non-church atmosphere it will appeal to even a wider audience. We cannot forget to mix in the vast television footprint that Lakewood church promotes, along with its web site, daddy John Osteen’s books are still in almost all Christian bookstores so it is not difficult to understand how it can gather 30,000 people in Lakewood ’s rented 16,000 seat arena, formerly the home of the Houston Rockets. What saddens me the most is that one hears little, if any, Law & Gospel proclaimed by Joel at Lakewood Church . To quote something I remember hearing “dad” Hagin say: “how do you poison a dog? You put the poison in with the good meat.” I do not want to press the analogy too far but the reality is that 30,000 people are not being biblically fed a balanced spiritual diet that will promote true growth in their lives. What you do hear is a synthesis of WOF concepts wrapped up in a seeker-friendly environment by a young man with a winsome smile. Lastly, we cannot lose sight of the fact that a certain synergy builds with any church when it begins to reach such a size. People, who have no solid doctrinal foundation, will want to attend the place where “something” is happening (throw in a coffee bar, ice rink and gym does not hurt either). In America , bigger is better. After all, many posit, if Joel was not being used of the Lord then why would God allow all these people to come to Lakewood church? Be astonished, O ye heavens, at this, and be horribly afraid, be ye very desolate, saith the LORD. For my people have committed two evils; they have forsaken me the fountain of living waters, [and] hewed them out cisterns, broken cisterns, that can hold no water. As much as Joel no doubt believes the growth they’ve experienced is due to the blessing of God it really boils down to three simple things, which have nothing to do with God at all: (1) his father’s legacy and an already existing mega-church; (2) Joel’s slick marketing abilities; (3) a biblically errant, but hugely popular message which appeals to the masses seeking to have their ears tickled and experience a “good time” in church. Please pray for Joel Osteen, like it or not, he currently has a tremendous impact on many people. Pray the Lord open his eyes to biblical truth and may he take as bold a stand to expose error.